On the second day of the annual national conference of Grassroots America Defends the Bill of Rights from Oct 17th to 21st, 2003, in Washington DC, the California delegation to the conference went to the Capitol for lobbying. 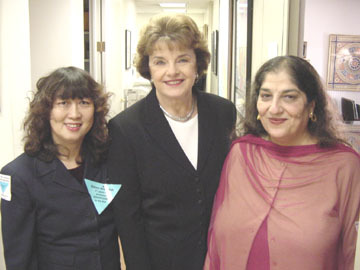 Top picture shows from left: Cecilia Cheng of the Justice for New Americans, Senator Diane Feinstein and Samina Faheem Sundas, Executive Director, American Muslim Voice. 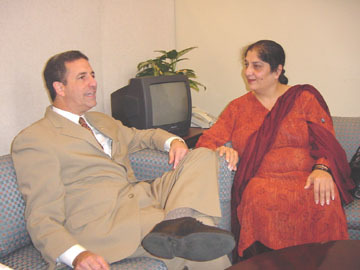 Left picture shows Samina Faheem Sundas with Senator Russel Feingold.